I watched this great documentary the other day that explains what I have been seeing over the last 10 years. Baby Boomer's are caring high personal debt, saving less, and yet are more wealthy than they were a decade ago. Interest rates have remained at there lowest levels since most of us can remember. Lower interest rates can mean we can borrow more today than 5 years ago, and many Boomer's are doing it. For example when it is time to renew your mortgage, many are taking advantage of lower rates, the lower payments and pocketing or should I say spending the difference. Take a someone who applied for a 350,000 mortgage on a 20 year amortization @ 4.5%, with a payment is $2,206 on a 5 year term. When they go to renew the balance of 289,227 at only 2.99% the monthly payment is down to $1933 (over the remaining 15 years). Even worse many are extending the mortgage back to 20 years and lowering the payment to $1600 a month. An extra 600 a month could sure come in handy for other things. At the same time they are expanding their personal Lines of Credit, and expanding their balances on credit cards. The reality is debt is increasing for many Baby Boomer's. If you are fortunate enough to have a pension plan with work count yourself lucky, you are saving money every month. If you work in the private sector or run your own business you are more than likely to not save at all. The cost of living is up 1.2 percent in BC from January to February. If you look closer the price of transport is up 2.4%! Increases like this can have a direct impact on the ability to save. Retirement may be an important, but paying the bills is more. This seems impossible ... but this is true. Boomer's are inheriting real estate, investments and family heirlooms. Their net worth on paper has never been larger. As their parents downsize, and pass away many boomer's have become landlords. Renting the parents home/family vacation home and using cash to purchase real estate. But this increasing wealth may stop at the The Baby Boomer's. The fact is the Boomer's may be the last generation to be better off than their parents for a very long time. Does this mean they will have a great future, or will be they be crushed under the weight of over spending, ballooning personal debt and lack of savings? Only time will tell. Make sure to check out this documentary on the Baby Boomer's from the CBC's Doc Zone called "Boomer Generation". 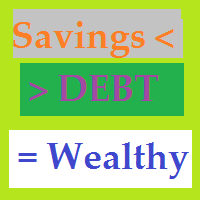 Leave Your Response to "Baby Boomers High Debt Low Saving Very Wealthy"
Your comments are appreciated. Please Do Not include links in your comments but instead select the profile setting as "Name/Url". Have fun and thanks for your comments! Plan for Financial SUCCESS !